I couldn't believe that 25 of us met at the Peter Pank Diner for breakfast!!! It was WONDERFUL to see so many of the friends we made on our Disney Cruise this past August, plus a new friend who will be sailing with us in August of 2006. We put the kids all down one end of the table, and the adults were at the other end. It's amazing how well all of us, and our kids, get along :} We all felt like old friends from the first time we met, back at the Radisson, and onboard the Magic. Mary Rose and her husband Bob-John very kindly opened their beautiful house to us. 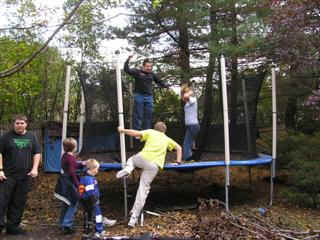 The kids loved the trampoline in their backyard.